The traditional art of babywearing is a real skill and one of the best ways to learn is with the help of experienced practitioners who will ensure you can carry your baby in a sling with confidence, competence, comfort and safety. borrow a sling that really suits your needs. As part of a consultation at The Sling School, you can choose a sling from our extensive sling library for a free two weeks’ hire. 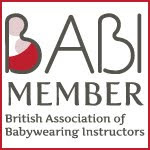 Join us at our next consult on 26th of June, where we will focus on using Asian-inspired Baby Carriers (Mei Tai, Podaegi and Soft Structured Carriers), on the front and on the back. This consult is suitable for babies from 4-5 months old.